The new, bigger gallery will give up-and-coming artists room to grow. Muzae Sesay will be the first artist showcased at the new Part 2 gallery. When Athen B. opened in 2015, it was a revolutionary space. Born of Chicago photojournalist Brock Brake and Bay Area-bred gallerist Sorell Raino-Tsu, the urban, contemporary art gallery focused on promoting art — whether on their walls, or the walls of the city — that sparked dialogue. They held proposal- and résumé-writing workshops for resident artists and connected them with public art projects, served coffee from local roasters, and offered internship opportunities for Oakland high schoolers. So, its closure in December felt abrupt, as well as a loss for the city. "It's sad that it happened," said Brake. But, in the rapidly shifting art world and neighborhood, "It's kind of perfect timing." Brake and Raino-Tsu have split ways, but the downtown Oakland spot is getting an upgrade right next door. Brake, alongside co-owner Dan Pan, is opening a gallery with a new vision and a new name: Part 2. "I'm trying to build something that's not really present for our community," said Brake as he showed me around the new space, which includes artist studios and is nearly three times the size of Athen B. Brake plans to use what he's learned from working at high-caliber galleries such as Gagosian in San Francisco to elevate Part 2, while keeping the focus on up-and-coming artists. "I want an adult space where everyone feels welcome," he said. "There are few spaces in the Bay Area that look like a museum or blue-chip gallery but function as a platform for younger, emerging artists and collectors." In conversations with his artist friends over the past months, Brake also detected a shared desire to work on a larger scale, with fewer group shows and more space for works. So, unlike the crowded walls of Athen B., Part 2 will give 4 or 5 feet of space between pieces to mimic the layout of bigger institutions such as the SFMOMA. "It'll look a little like the big fancy galleries that everybody might be a little intimidated to go into, but with a much more personal vibe," said Brake. "People can come in, they're greeted, they feel comfortable, and they won't feel dumb asking questions." Part 2 won't just be a gallery — it will also function as a home base for Oakland artists. Brake's extensive curatorial skill and knowledge of current art culture allows him to do more than just hang paintings on walls. He connects artists with museums and press opportunities, even as they progress to bigger opportunities outside the Bay Area, and acts as a consultant for public artists looking for projects. Athen B. had a heavy focus on facilitating murals, but Brake is taking a few steps back from that sector of the art world with Part 2, particularly amid the growing perception of public art as a form of gentrification. He plans to move his muralists to San Francisco graffiti gallery 1AM (short for First Amendment), where he works as the director and curator alongside founder Pan. Brake comes from a skateboarder background, spending his youth running around with the "graffiti kids" and documenting them. Public art is near to his heart, so he plans to continue facilitating projects, but while being more conscious in his role as a consultant. Part 2 is opening in the space formerly occupied by Brake's 1AM Generator, the East Bay answer to his San Francisco location. The new gallery will open on March 10 with a solo show by Muzae Sesay titled Domestic Dive. Sesay's vivid landscapes of colliding shapes and colors arise from his fascination with the fragmentation of memory, especially that of places we call home. Oftentimes, rigid beliefs associated with intimate spaces overshadow the validity of our recollections — Sesay's work aims to question these "truths." Furthermore, he explores through unusual architectural arrangements the way in which many people truly experience memory: as a blending of vignettes and emotions, rather than as a single, acutely detailed image. "I have a real spotty memory," said Sesay, explaining the inspiration for Domestic Dive. "I don't remember exactly where things were or exactly how the spaces looked, but I remember how it felt to be there and the warmth of the light." Some of his interest in memory is rooted in his imagined recollections of Freetown, Sierra Leone, his father's homeland — a place he has never been to. The dominant narratives surrounding Freetown that he heard growing up in America were fairly unflattering: civil war, famine, Ebola, etc. But through his work, Sesay takes advantage of the fluidity of memory by attempting to implant positive aspects of Freetown into his consciousness. Sesay paints in a studio upstairs in the Part 2 building. 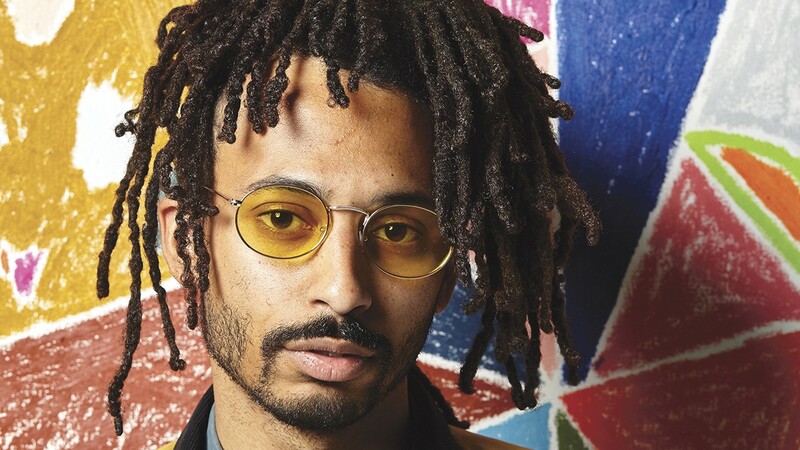 He made the move to Oakland from San Francisco amid rising rents as well as a sense of connection to Oakland's creative community. "It was just a process of really understanding how important painting and art is for me and making a move that reflected that," he explained. At a show in San Francisco, Sesay met Brake and Raino-Tsu, who encouraged him to keep pursuing art at a time when he was growing disillusioned. "I attribute a lot of where I am now to them," he said. "I needed that push, and they definitely helped me make it." Sesay was originally scheduled to exhibit Domestic Dive at Athen B., but the change in venue has given him the opportunity to present a more extensive collection, as well as more room on the walls for people to immerse themselves in his paintings. Solo exhibitions as opening shows are not the norm for galleries, but Part 2 isn't trying to follow a traditional path. Sesay's show will also be open from noon to 10 p.m., allowing a more diverse crowd to attend — not just twentysomethings looking for a nighttime soirée. Brake aims to make Part 2 not just innovative, but also inclusive. Resident artists, like Sesay, will have a say in which artists and what kind of art they'll be showing and have more space to experiment and grow within the gallery's walls. Community members are invited to experience cutting-edge contemporary art for free, without the fear of being greeted with condescension.